With DriveWorks Pro you can create a custom product configurator that anyone can use. Use DriveWorks locally or on the web to configure custom designs quickly and easily. As DriveWorks Software modules are all built on the same well architected platform, it is very easy to step from one level up to the next, adding functionality and integration capabilities as needed. For this reason the DriveWorks Pro training builds on the basic principles covered in the DriveWorks Solo training. These 2-3 minute video clips are a quick way to learn how to use the added functionality in DriveWorks Pro. How Else Can I Learn? We want to help others to help themselves, to do this we have provided many resources to help you learn more about DriveWorks Pro. You can find answers in the DriveWorks Pro Online Help File, see specific functionality in action on DriveWorksLive.com, sign up for one of our upcoming webinars or join in with the discussion in the DriveWorks Pro Forum. 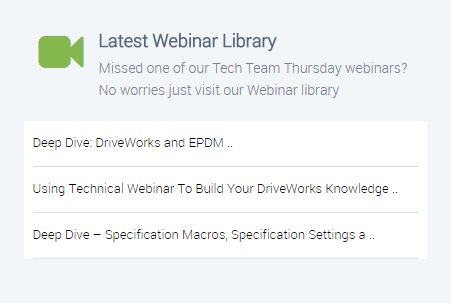 You can also learn more about specific DriveWorks Pro functionality with our library of Technical Webinars, just search for a topic you’re interested in to see the webinars available.